Gold Technical Strategy: Intermediate-term (past 3 months) mixed as we approach the 50% retrace of the ‘Trump Trade,’ short-term price action is bullish. 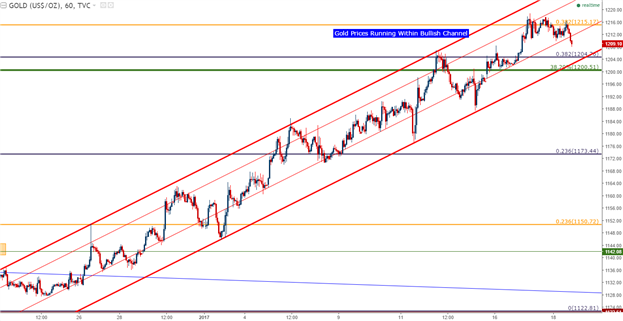 Gold prices are continuing to run-higher after eclipsing numerous resistance levels. 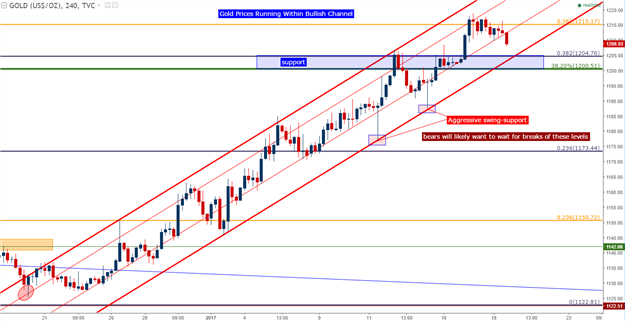 In our last article, we looked at the continued-move higher in Gold prices as the market was retracing a previously bearish trend. The election-inspired trend sent Gold prices lower by more than $225 in a little over a month to tally a peak-to-trough run of -16%. But shortly after the Fed hiked rates in December, Gold prices began moving-higher and haven’t yet stopped. This has produced a rather clean bullish trend channel as prices have been running higher since setting that low in the second half of December (shown below).